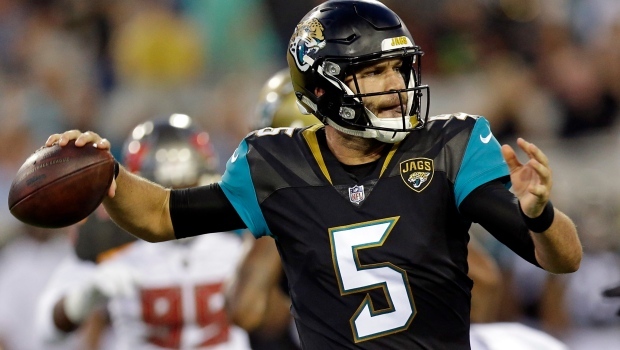 JACKSONVILLE, Fla. -- The Jacksonville Jaguars are sticking with Blake Bortles as the team's starting quarterback. Marrone says he "spoke to both quarterbacks this afternoon and told them Blake will be our team's starting quarterback. I believe this gives us the best opportunity to win." Bortles fumbled on Jacksonville's third play in each half, leading to 10 points for the Texans and prompting Marrone to switch to Cody Kessler. Marrone said after the game he would open up the QB job for the second time in as many years. Marrone also benched Bortles in the 2017 preseason, only to give him back the job nine days later. Marrone took even less time to go back to Bortles this time around, saying he will start Sunday's game against Philadelphia (3-4) in London. The Jaguars (3-4) have lost three in a row and four of five.